WEST LAFAYETTE, Ind.  Engineers at Purdue University have developed a new way of producing hydrogen for fuel cells to automatically recharge batteries in portable electronics, such as notebook computers, and eliminate the need to use a wall outlet. The findings will be presented Sunday (Aug. 28) during the annual meeting of the American Chemical Society in Washington, D.C., and also will be detailed in a peer-reviewed paper to appear in an upcoming issue of the journal Combustion and Flame. The paper was written by research scientist Evgeny Shafirovich, postdoctoral research associate Victor Diakov and Arvind Varma, the R. Games Slayter Distinguished Professor of Chemical Engineering and head of Purdue's School of Chemical Engineering. This research is supported by the Purdue Hydrogen Economy initiative of the College of Engineering and is being conducted as a part of Purdue's new Energy Center, created this year at the university's Discovery Park. Note to Journalists: Findings will be presented at 2:30 p.m. in the Burnham Room of the Grand Hyatt Washington hotel in Washington, D.C. An electronic copy of the research paper is available from Emil Venere, (765) 494-4709, venere@purdue.edu. This presentation reports novel chemical compositions for combustion-based generation of hydrogen, which can be used to feed fuel cells for emergency power supplies and portable electronics. To simultaneously reach high hydrogen yield and combustion efficiency, we use metal borohydride/aluminum/water mixtures, in which water acts as an oxidizer for both aluminum and metal borohydride, and also as a source of hydrogen. Metal borohydride is an additional hydrogen source, while aluminum increases combustion temperature, eliminating the need for a catalyst. Nanoscale aluminum powders and a gelling agent (polyacrylamide) are used to ensure high combustion efficiency. Thermodynamic calculations and combustion experiments were performed for NaBH4/Al/H2O system. 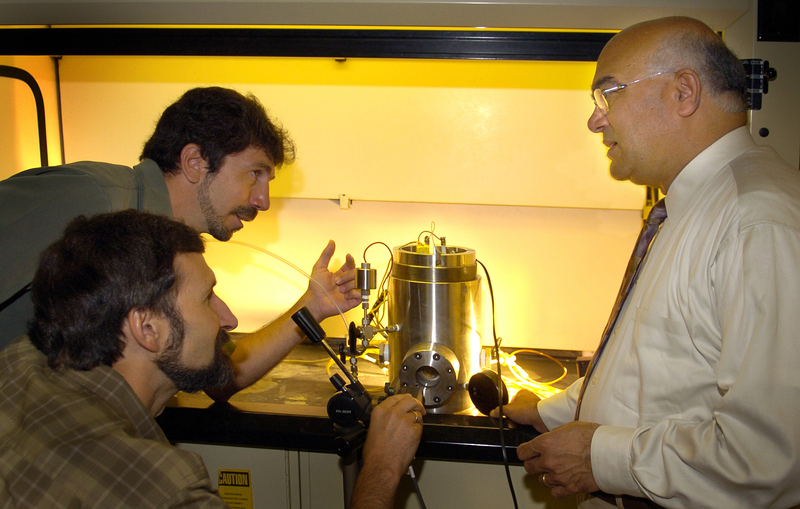 The experiments were conducted in a stainless steel chamber, using digital video recording and gas chromatography. Experiments with various Al/NaBH4 mixture ratios at stoichiometric water contents show that addition of Al significantly stimulates combustion. Mixtures with 50-70 wt.% of Al have demonstrated simultaneously high H2 yield (6-7 wt %) and stable self-sustained combustion.